I decided to read this novel because I found a mention of it in an unrelated book as one of the best novels about first contact and colonization of another planet. 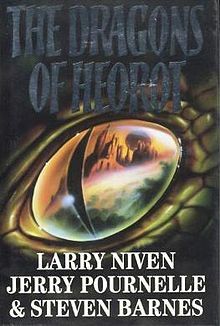 However the reference actually was for the Legacy of Heorot (1987), this books prequel. All the big mysteries of the Legacy of Helot are revealed in the first couple of chapters of Beowulf’s Children, so if you were planning to read the prequel , I would recommend doing that first. This book focuses on a human colony settlement on the planet Avalon. Years after a disastrous encounter with an alien species nearly destroyed the colony; the first generation of children has grown up feeling constrained by their parents’ rules. Confined to an island settlement, the youth of the colony wish to venture to the mainland of Avalon and continue with efforts to colonize the planet. They are left with little chance for adventure and reject their parents’ timidity. The elder generation, still cautious after nearly being wiped out is loath to let the youth explore, as it might attract the aliens, known as Grendels, attention and bring destruction to the colony. Additionally there is a split in the youth generation between natural born children, and those who were grown from embryos on the colony ship. The youth finally win the chance to explore the mainland, but when the expedition is nearly killed by an unknown presence, the elder generation locks down the colony. A struggle then begins for the future of human settlement on Avalon. I enjoyed this book, as a story of explorers building a colony on a new world. It also features a unique alien species in the Grendel’s (with an elaborate biology), and an engaging mystery over the fate of the mainland expedition. It raises interesting questions over should a society be guided by cautiousness of age or the fearlessness of youth. Both sides are shown as having sensible arguments for way their attitude is correct. If you want to see youth politics run-amok and a vision of teenage delinquency designed to scare the squares of America, check out the satirical film Wild in the Streets. When a cynical politician attempts to manipulate the youth vote by running rock star Max Frost as a candidate, he creates a true generational conflict as the voting age is lowered to the age of 14, and adults are forced to tune in and drop out on LSD. Of course every revolution shows the seeds of its own destruction, and the 12 year-olds of America wonder why they can be part of the fun. It’s also the move that originates the stone cold classic rock song Shape of Things to Come (famously covered by the Ramones), and then selling in its old age as a marketing jingle for Target stores.